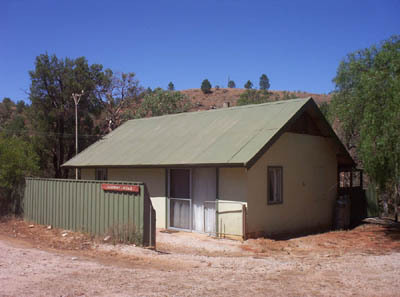 Jackeroo's Cottage at Willow Springs Station in the Flinders Ranges of South Australia. The Jackaroo's Cottage - Willow Springs. Jackaroo's cottage has an open plan lounge/dining-room/kitchen with open fireplace. Supplied with an electric fridge, gas stove, microwave, crockery, cutlery and cooking utensils. The building has two bedrooms, one with a double bed, the other with a double bunk and one single bed. A pillow, Quilt and Blanket are provided for each bed. Extra bedding may be required in the cooler months. A high chair and cot is available. Limited wood is supplied for wood fires.